My Creative Time. I was in need of a small little gift and I had a little time in my craft room so I decided to play along in some of the challenges going on as well~ yippy! 2.) Little Red Wagon Challenge #357 Let's get inky! These are absolutely gorgeous, Sherrie!! I love the Peeled Paint and Spun Sugar backgrounds!! They look amazing!! Love those colors together!! The hearts coming from the cup are a perfect touch!! The butterfly, too!! And such gorgeous ribbon to top them off!! Love, love these my friend!! So beautiful!! Love this!!!! So cute! Miss crafting, but always happy to see my crafty friends work! They are so precious. Love the backgrounds and cute images. Adorable tags my friend. These are fabulous!! I love the pink and green combination! What a wonderful way to share some treats! I hope you're having a fantastic long weekend! Oh Sherrie these treats are fabulous!!!! I love that pretty bow and the tag you created is so sweet! I love the colors together and I really like that font on the sentiment. These are awesome! Thank you for also joining our Funday Friday challenge my friend! These are soo fun and cute ! Great colors ! These are so cute Sherrie! Love the color combo and the mixture of coffee, hearts and butterflies! What a terrific gift too! Thanks for sharing your talents with us at Seize the Birthday! 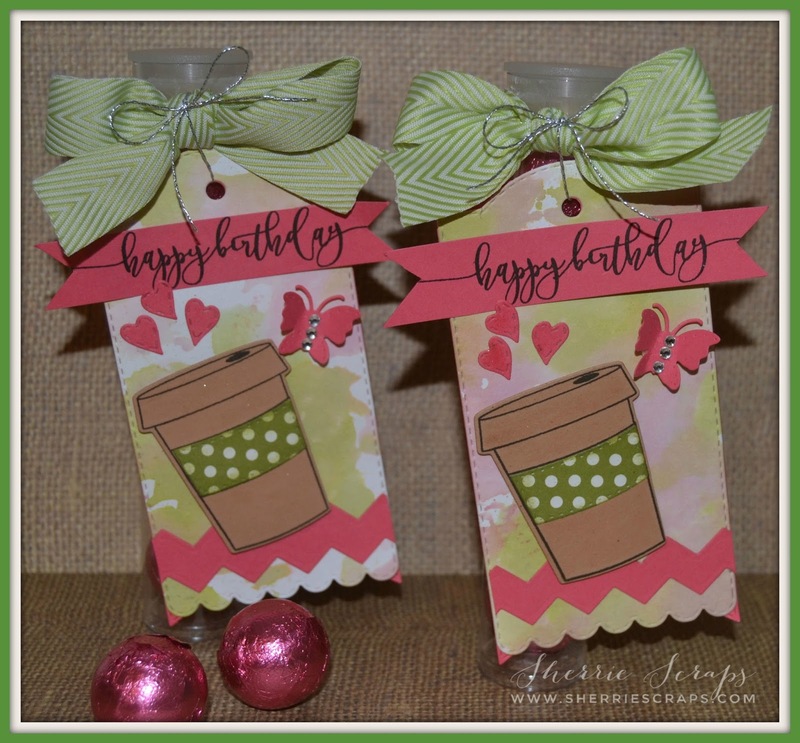 Very cute tags, love the big bows! Oh this is soooo pretty!!! What a gorgeous way to present a yummy treat! Beautiful, Sherrie! Such super cute tags! Love the fun color combination you used! 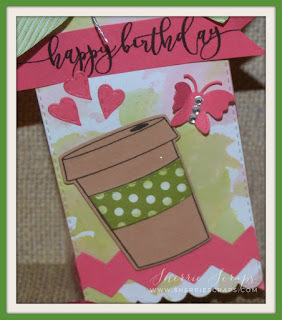 The coffee theme is just amazing and those sweet butterfly and heart accents are just perfect! Have a wonderful week my friend! Love love love these! LOVING the colors and the cups!!!!!!!!!!!!! So cute Sherrie, the paint is a great touch! 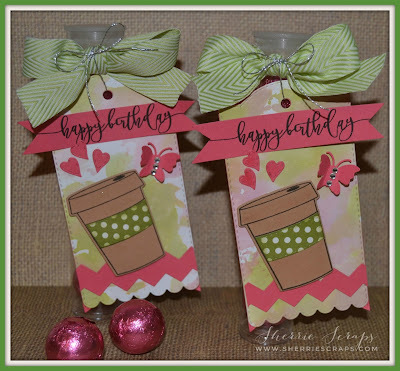 What a cute project Sherrie! You always make the best treats! Love the butterflies! What a adorable tags!! Love the gorgeous background, the pretty bows and the little butterflies!!! These treats are fabulous!! Have a great day. These gifts are adorable! 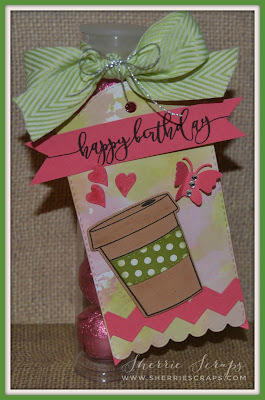 The tags are so pretty with the watercolors which makes them perfect for our challenge over at Cut It Up! Thanks for sharing! The tags are simply beautiful!! I love the pretty color palette, ribbon and the water colored background! !Love these tags my friend!! Yummy! Love that luscious bow and the pretty water colors. Thanks for linking to Cut it Up for our Watercolor challenge! Oh these are so CUTE! I love these colors, so pretty! That's my favorite stamp set - I love the font! Hope you had a wonderful weekend and hope you are having a great Sunday! Adorable Sherrie Love those cups and the yummy colors. Such an awesome tag gift set! I'm totally addicted to coffee cup stamps and dies! Love it!! Cute, cute, cute! I love the pretty colors and fun prints and that coffee cup in polka dots is super cute! I'm also loving those big, gorgeous bows - such a great finishing touch!